New England asters (Symphyotrichum novae-angliae) may be the most famous type of aster, but there are, in fact, many types of this standout fall flower, and an even greater number of relatives in the greater plant family known as Asteraceae. 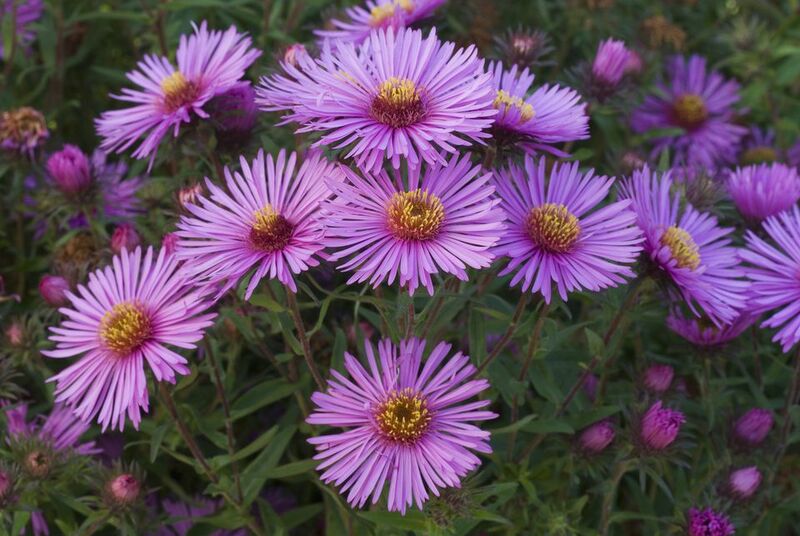 What accounts for the fame of the New England aster, specifically? Maybe we can attribute it to the name. Asters are fall flowers, par excellence, and the New England region of the United States is famed for being a mecca for autumn travelers. But a more likely explanation is that, with their thick stems, New England asters are useful as cut flowers, landing them in many a floral arrangement delivered by the local florist shop. How can you beat that for public relations? When you look at what appears to be a single New England aster "flower," you are actually looking at multiple flowers joined together to form a unit. Specifically, what you are really seeing is a number of ray florets (or, simply, "rays") and a number of disk florets. The latter compose a center (or "eye"), from which the rays radiate out as if they were petals. In other words, this is a "composite" flower. Indeed, while the Asteraceae family is often called the "aster" family, an alternate name for it is the "composite" family. Height: up to 6 feet. Flower formation: clusters of individually-stalked flowers. Flower size: 1.5 inches across. Flower color: purple, pink, or white rays with yellow centers. The plants typically bloom during August and September. Migratory monarch butterflies take advantage of the nectar-rich flowers in fall, as do bees. Grow New England aster plants in USDA plant hardiness zones 4-8. Their preferred location is full sun in a spot with good drainage. Their water needs are average. Fertilize them with compost. Just as Chrysanthemums (hardy mums), being a flower geared to fall displays, are often pinched back through part of the summer to make them more compact, more appealing plants for autumn, so New England asters are often pinched back to control their growth and make them bushier. Unfortunately, their lower leaves often become ratty-looking as the summer progresses, so gardeners typically cut them down to the ground as soon as the blooming season is over. Better yet, surround them with shorter, compatible plants that will disguise the lower half of your asters. A greater challenge is posed by the plant's susceptibility to powdery mildew and rust. But disease-resistant cultivars are, in fact, available. For example, 'Vibrant Dome' is resistant to powdery mildew. It is also a good alternative to purple cultivars, such as 'Purple Dome' (of which it is a sport), because it bears bright pink flowers. You will not have to worry about staking this one because it grows to be only 15-20 inches tall. Provide a good amount of space between the plants to promote air circulation. Water the plants at their bases, not overhead. Thin out the plants by, for example, dividing these perennials periodically in early spring or in fall. According to the Chicago Botanic Garden, about 250 types of asters are native to the Northern Hemisphere. As mentioned above, New England asters come to mind first when people hear "aster," but many other kinds exist. The New York version (Symphyotrichum novi-belgii) runs a close second and is very similar in appearance. What is the difference between the two, and why does it matter? Well, true plant enthusiasts will be shocked at the very posing of the latter question. Would a baseball fan not be mortified at the suggestion that the difference between the New York Yankees and New England's Boston Red Sox does not matter? Of course not. New England aster leaves are hairy (that is, they have little bristles on them), while New York aster leaves are smooth to the touch. If you have a sample of each type of aster on hand so that you can perform a direct comparison, New England asters have stems that are the thicker of the two. Their respective common names are somewhat deceiving and do not necessarily offer a hint as to their respective identities. While Symphotrichum novi-belgii can, in fact, be found in the state of New York, so can Symphyotrichum novae-angliae. Likewise, the former calls the New England states home just as surely as it does New York. The fact is, the two types share a large swath of territory in eastern North America, to which they are native. However, New England asters are indigenous to a wider area of North America, being represented even as far west as California, Oregon, Washington and British Columbia.